Starring Robert Pattinson, Mia Wasikowska, David Zellner, Nathan Zellner, Robert Forster, Morgan Lund, Joseph Billingiere, Ray Kelleher, Gabe Casdorph, Angela Summers, Gary Brookins, Deanna Milsap, Palmer Scott, Landon Weeks, Robyn Adams, David Daniel, Jon Horan, Amy Jex, Kyley Jex, LaNay King, Geff Tucker, Greg Tucker, Maria Tucker, Sherrie Tucker, Cherise Weber, Shane Wright, Larry Zeng, David Wingo and Russell Mael. Screenplay by David Zellner & Nathan Zellner. Directed by David Zellner & Nathan Zellner. Distributed by Magnolia Pictures. 113 minutes. Not Rated. Reading the synopsis of Damsel, I got a little worried. 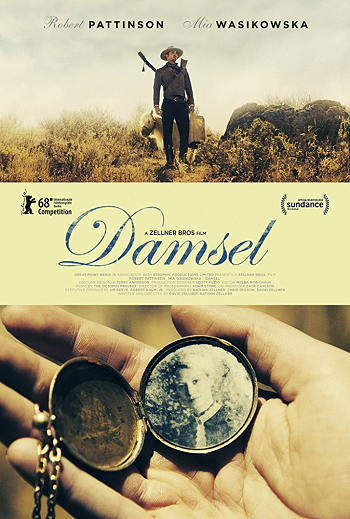 It is the story of Samuel Alabaster (Robert Pattinson) who embarks on a journey through the Old West with a miniature horse named Butterscotch (Daisy). He is fixing to propose to and marry Penelope (Mia Wasikowska) the woman that he loves, with the help of hired (drunk) clergy, Parson Henry (David Zellner). It’s been a while since Robert Pattinson has delivered a satisfying performance and he is known for playing the brooding heartthrob. Rob Pattinson in the Old West with a miniature horse? My prediction was that Damsel was either going to be awful or surprisingly quirky. After watching it one and a half times, I recognize that there is a spectrum between these absolutes. In fact, it is possible to be a little bit of both. I am a good-news-first kind of person, so let’s start with the positives. Mia Wasikowska plays a bold, fearless, relatable Penelope, with beauty and strength. It is easy to see why Samuel is in love with her. Together, they make a fine looking couple. The role is unexpected at times and Wasikowska plays Penelope’s range of emotions with ease. If you make it through the first 52 minutes of the movie, you will be treated with her performance for the final hour. Those first 52 minutes are hard. And slow. If you dig yourself in for the long haul narrative, the winding story is interesting and delivers a few satisfying plot twists. But it is really slow. And it’s not just the drawl. There is way too much repetition, where it seems like the Zellner Brothers are going for a gag, but it takes so long to get there and the characters are so awkward that it rarely delivers anything but the discomfort. As an example, there is a character that the credits refer to as “Barrel of Laughs” (played by David Wingo). We hear him throughout the early town scene – as Samuel enters and as he leaves – a man, dressed in a barrel, maniacally laughing. Our final glimpse of him is as he is being hung, still in the barrel, still maniacally laughing. It’s off-putting to say the least. If you are going in to Damsel a Robert Pattinson fan, where your number one goal is to see Pattinson in any role on the big screen, this still may not be the movie for you. Did you see O Brother Where Art Thou? Do you remember seeing George Clooney stretch in to his Old West bumpkin role? It was mesmerizing in the horror of the experience, right, but it was fresh and new and ironic. Samuel is played like Rob Pattinson trying to channel his inner George Clooney trying to play the ironic bumpkin. It comes across as stereotypical instead of fresh, with his darkened tooth and slow, southern drawl. Samuel sings a little self-written ditty on behalf of his lady love that may have ruined the words “Honey Bun” for me forever (with lyrics by David Zellner). The main lead of the film is the conflicted Parson Henry. From the opening scene until its photo-finish end, this is really his story. He looks for meaning and purpose and Natives. His trail goes from being gifted the role of Parson from the burnt-out “Old Preacher” (a cameo by Robert Forster), to his involvement in the marriage turned “rescue” of Penelope. David Zellner keeps pace with the slow drawl and keeps the audience wondering if he will ever catch a break. The real question is do we really care? Copyright ©2018 PopEntertainment.com. All rights reserved. Posted: June 29, 2018. Tags: Amy Jex, Angela Summers, Bonnie Paul, Cherise Weber, Damsel, David Daniel, David Wingo, David Zellner, Deanna Milsap, Gabe Casdorph, Gary Brookins, Geff Tucker, Greg Tucker, Jon Horan, Joseph Billingiere, Kyley Jex, LaNay King, Landon Weeks, Larry Zeng, Maria Tucker, Mia Wasikowska, Morgan Lund, movie review, Nathan Zellner, Palmer Scott, PopEntertainment.com, Ray Kelleher, Robert Forster, Robert Pattinson, Robyn Adams, Russell Mael, Shane Wright, Sherrie Tucker. Bookmark the permalink.